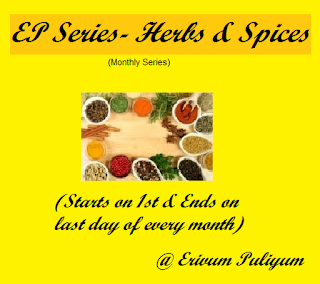 Yet another interesting series of herbs & spices is on its way for Sept @ Foodomania.First of all let me thank each one of you who have regularly supported the event at my space and had been sending me mails and comments for the betterment of the event.Looking forward for all feedbacks & suggestions always.The theme this month is "Oregano & Paprika".You can link your old as well as new entries with specifically these as the main ingredients.You can use either of the two in one dish and also you can link only veg entries ;however eggs can be included.Please don't link up any recipe that uses oregano or paprika as garnish.The event is guest hosted by Kavi @ Foodomania.A bunch of Thanx to Kavi for taking up the initiative to host the event and she is also giving away three cook books this month,the details of which is here.Looking forward for more innovative and interesting yummy recipes,please do visit her space for the details of the event and the cook books give away. Nice choice of spices, pretty hectic here, hopefully I'll send a couple of entries this month..
Nice event Julie, will post my entry very soon. Great theme and happy hosting dear! Bookmarked the previous post.. will try to participate in this event..
You keep rocking with your events dear :) Cheers!! hi Julie, have a doubt...Paprika means only capsicum seeds owder recipes or even capsicum recipes can be linked?? Nice event! Try to link recipes soon. Plz check and do let me know if it is ok ....bcoz I got little confused while linking the recipe . Plz help !! !